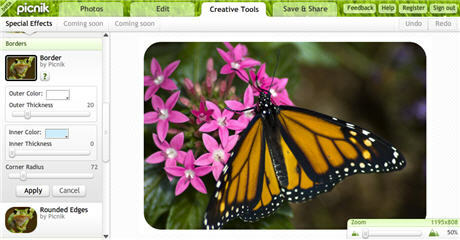 Picnik.com, the most popular online photo editing suite, has added some new features today. That includes support for Picasa web albums and ability to add frames and rounded corners to your pictures. With Google making the Picasa API public, Picnik can now load and save photos to and from your Google Picasa Web Albums account directly. Earlier, this feature was available only with Flickr images. Even will all these nice photo editing features, Picnik and others will be under tremendous pressure to innovate as Adobe is gearing up to change the rules of the game.